A chip with 64-bit architecture. A fingerprint identity sensor. A better, faster camera. And an operating system built specifically for 64 bit. Any one of these features in a smartphone would make it ahead of its time. All of these features in a smartphone make it an iPhone that’s definitely ahead of its time. iPhone 5s is precision crafted down to the micron. And it’s evident throughout. The beautiful aluminium housing. The sleekness of metal and glass. Sapphire crystal in the Home button. And more sapphire crystal protecting the iSight camera. Design and construction on this level is unmatched. As a result, iPhone 5s looks and feels unbelievably thin and light. You check your iPhone dozens and dozens of times a day, probably more. Entering a passcode each time just slows you down. But you do it because making sure no one else has access to your iPhone is important. With iPhone 5s, getting into your phone is faster, easier and even a little futuristic. Introducing Touch ID — a new fingerprint identity sensor. There’s fast. And then there’s A7 fast. The new A7 chip gives you CPU and graphics performance up to 2x faster than the A6 chip. Even more impressive, A7 makes iPhone 5s the first 64-bit smartphone in the world — that’s desktop-class architecture in a super-slim phone. And because iOS 7 was built specifically for 64 bit, it’s uniquely designed to take advantage of the A7 chip. The new M7 coprocessor is like a sidekick to the A7 chip. It’s designed specifically to measure motion data from the accelerometer, gyroscope and compass — a task that would normally fall to the A7 chip. But M7 is much more efficient at it. Now fitness apps that track physical activity can access that data from the M7 coprocessor without constantly engaging the A7 chip. So they require less battery power. M7 knows when you’re walking, running or even driving. For example, Maps switches from driving to walking turn-by-turn navigation if, say, you park and continue on foot. And if your phone hasn’t moved for a while, like when you’re asleep, M7 reduces network pinging to spare your battery. 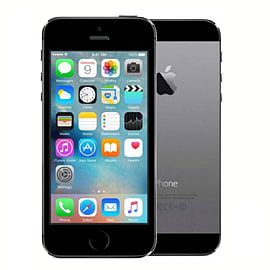 iPhone 5s features advanced technologies custom designed for the iSight camera’s hardware and software. So anyone anywhere can take an amazing photo at any time. It simply makes more sense to teach iPhone how to take a great picture rather than teach people how to be expert photographers. Here are just some of the capabilities of the new iSight camera. When you can’t be there in person, you can at least be there onscreen. Share some good news with your best friend or say “good night” to a travelling loved one with a FaceTime video call. The all-new FaceTime HD camera on iPhone 5s features larger pixels and an improved backside illumination sensor, so your smile lights up the room in almost any light. And because you can make audio-only FaceTime calls in iOS 7, your tête-à-tête doesn’t have to be face-to-face. iOS 7 was designed with iPhone 5s in mind. Everything about it takes advantage of the advanced technologies built into iPhone 5s — like the 64-bit A7 chip, the Touch ID fingerprint identity sensor and the new, even more remarkable iSight camera. In addition, iOS 7 introduces great new features, such as smarter multitasking, AirDrop and Control Centre, that make the things you do every day even easier, faster and more enjoyable. No matter what you’re doing or which app you’re using, finding your way round is extremely intuitive. So from day one, you know how to use our most advanced mobile OS on our most advanced iPhone yet. iOS 7 comes with an amazing collection of apps for the things you want to do and need to do, like sending emails and texts, browsing the web, shooting and sharing great photos and videos, getting directions and more. And all the built-in apps are optimised to take advantage of the A7 chip’s high-performance 64-bit architecture. iCloud lets you access your content whether you’re using your iPhone, iPad, iPod touch or Mac. And thanks to new features in iOS 7, it’s more indispensable than ever. Even if iPhone is your only Apple device, you can use iCloud Photo Sharing to send photos and videos to your friends’ iOS devices. They can comment as well as post their own photos and videos to your shared streams. And the new Activation Lock feature of Find My iPhone makes it harder for anyone who’s not you to use or sell your device.